CAN-8424-G | DeviceNet Slave Data Acquisition I/O Rack for use with I-87K and I-8000K Cartridge I/O Modules. 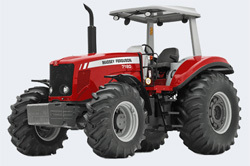 Comes with software utility for configuring and creating EDS file for plugged in I/O modules. DeviceNet Slave Data Acquisition I/O Rack for use with I-87K and I-8000K Cartridge I/O Modules. 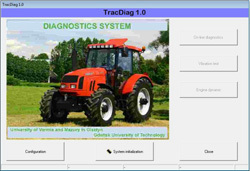 Comes with software utility for configuring and creating EDS file for plugged in I/O modules. 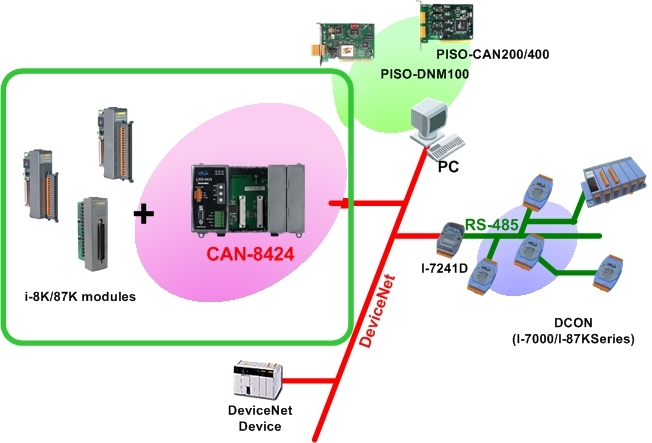 DeviceNet is one kind of the network protocols based on the CAN bus and mainly used for embedded network for machine control, such as textile machinery, printing machines, injection molding machinery, or packaging machines, etc. DeviceNet is a low level network that provides connections between simple industrial devices (sensors, actuators) and higher level devices (controllers). It allows direct peer to peer data exchange between nodes in an organized and, if necessary, deterministic manner. DeviceNet defines a connection-based scheme to facilitate all application communications. A DeviceNet connection provides a communication path between multiple endpoints. The endpoints of a connection are applications that need to share data. 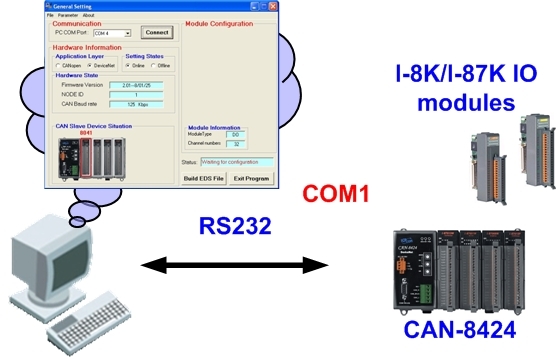 CAN-8424 main unit can be plugged in the DCON(/I-8K/I-87K) IO modules to create a customized DeviceNet slave device and application. Before applying the CAN-8424 in DeviceNet applications, users must understand the relationship between these DeviceNet applications and assembly objects within CAN-8424 DeviceNet slave. In order to allow user to easy apply the device on the network, ICP DAS also provides the CAN-8423 Utility tool to configure the IO connection path, assembly and application objects information and create the EDS file of the device. The following simple steps show how to use CAN-8x24 in the DeviceNet protocol.